We are pleased to present our award-winning curriculum as a free iBook for the Apple iPad. 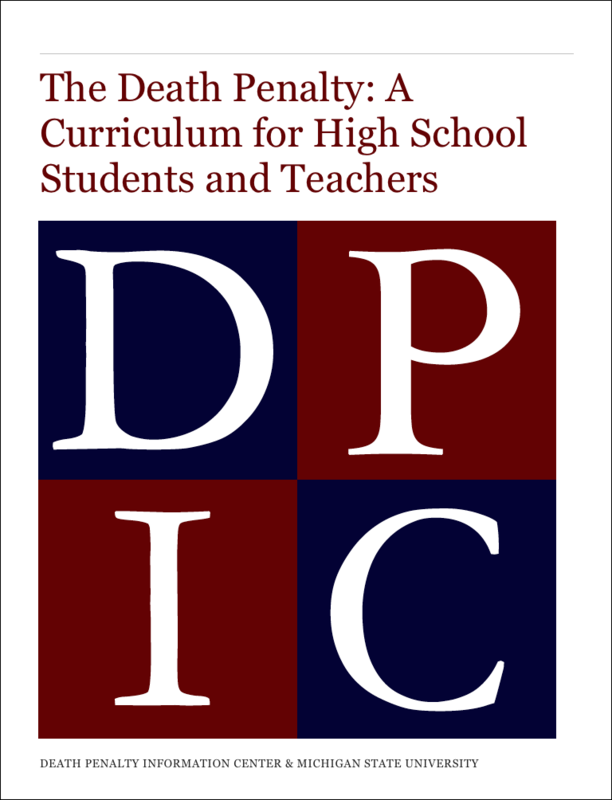 This award-winning curriculum for grades 8 through 12 includes background information on the death penalty, state specific information and outlines and commonly raised pros and cons of the death penalty. This balanced presentation was originally designed by the award-winning team at the Michigan State Communications Technology Laboratory in conjunction with the Death Penalty Information Center. The e-book was recently featured on Scholastic.com's Tech Tools. Enables users to navigate through the content in a touch-screen environment. Even when students are not on-line they can use the full curriculum and have access to instant definitions of every word and easy note-taking functions. When used with wi-fi, further references to outside materials are available. Curriculum includes color maps and interactive features. No textbooks to carry or lose. Click the image to the right to preview the Table of Contents of the iBook. Our iBook curriculum is best viewed in landscape (horizontal) mode. Further usage instructions can be found within the "Usage Notes" chapter of the iBook. 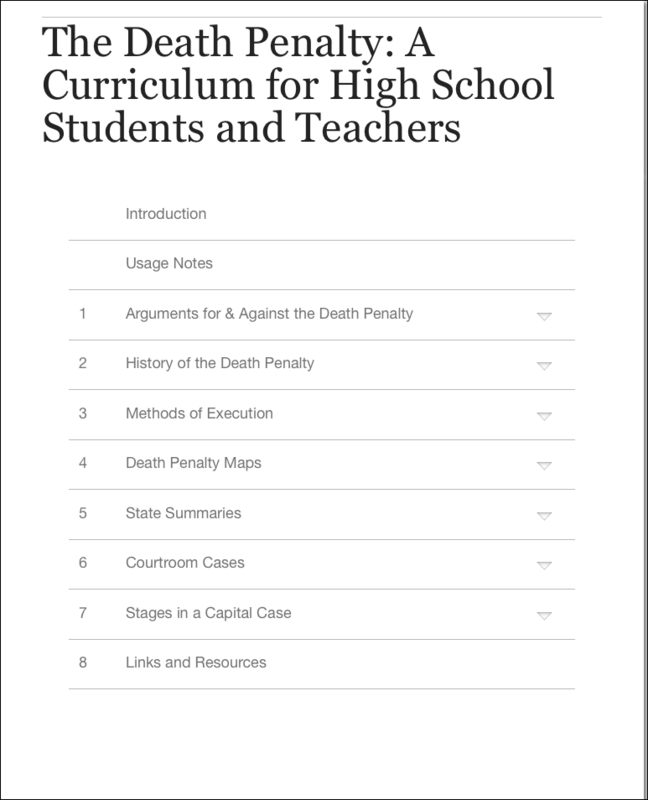 Teachers: Educational standards, sample lesson plans, and teacher notes for each section of the curriculum can be accessed by registering for a user account at www.deathpenaltycurriculum.org/user/register. 1.) Ensure that your iPad is running iOS 5.0 or later. 2.) Ensure that the free iBooks 2 app from Apple is installed on any iPad intended for the curriculum. You may install iBooks directly to your iPad by searching for iBooks through the App Store on your iPad. (This method requires that your iPad have an Internet connection.) Alternatively, iBooks can be downloaded for free here and then transferred from your computer to the iPad via iTunes. If you already have iBooks 1 installed, simply update to iBooks 2 using the "Update" tab in the App Store on your iPad, or use the update function of the Apps tab in iTunes on your computer. 3.) Download the book directly to your iPad by opening the iBooks app, clicking the "store" button within the app, and then searching for "Death Penalty Information Center." (This method requires that your iPad have an Internet connection.) Though free, this step requires an iTunes account. Alternatively, click here to download the curriculum in iBook format to your computer, then transfer the book to the iPad via iTunes. If you require further help installing Apps on your iPad, please view the Apple help page here. If you require further help downloading our iBook on your iPad, please view the Apple help page here. If you still have questions after reading these help resources, please email us. Please let us know how you like this new resource and suggestions you have for the future.